Lawrence Peter Berra grew up on Elizabeth Street in the St. Louis neighborhood called The Hill. 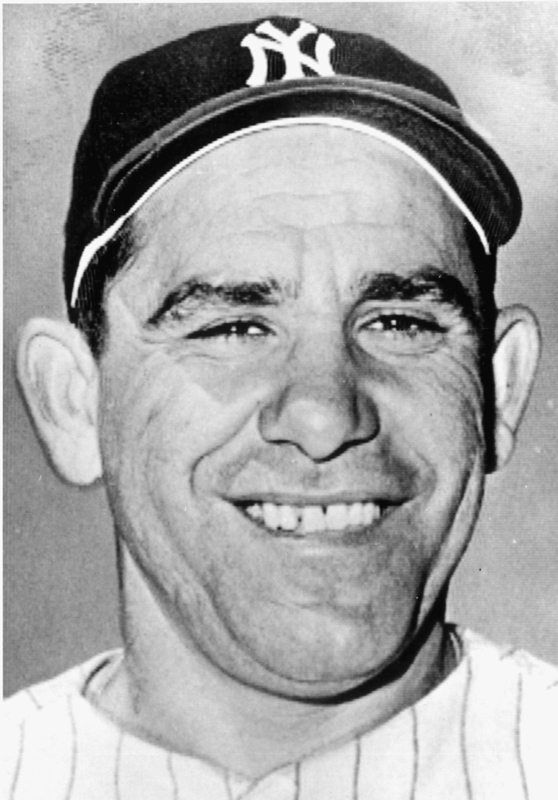 After heroic service in World War ii, Yogi Berra joined the Yankees late in the 1946 season and hit a home run in his first at-bat. For the next 17 years he anchored the greatest dynasty in baseball history, winning 10 of 14 World Series. Famed for fractured English in quotes such as “It ain’t over ‘til it’s over,” Berra was a three-time MVP. He holds numerous World Series records, such as 71 hits. As a manager and coach, he led his teams to five World Series, winning three. In 1973, Yogi Berra was inducted into the Baseball Hall of Fame. National Baseball Hall of Fame - Yogi went on to become a fifteen-time All Star, winning the AL MVP three times, in 1951, 54 and 55. He played in 14 World Series and holds numerous World Series records including most games by a catcher (63), hits (71), and times on a winning team (10), first in at bats, first in doubles, second in RBI's, third in home runs and BOB's. Yogi also hit the first pinch hit home run in World Series history in 1947.